The glory of landscape fabric! Well, well, well! A long-imagined weeding solution has become a reality this week! While working on weeding last summer, we were envisioning how we could possibly eliminate a portion of our weeds. 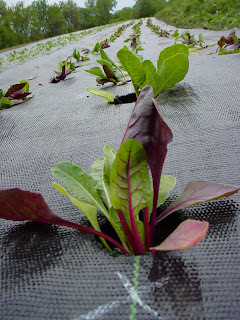 One idea that came up was landscape fabric; also known as weed mat, or weed barrier. It’s often used by folks in mum production. We looked into it, and with the various lengths and widths it came in along with its’ longevity (lasts at least 5 years), was the clear winner. 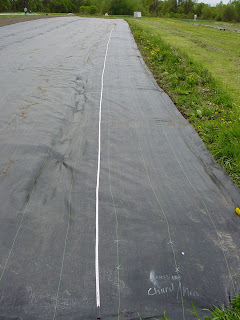 Not to mention that it covers paths – the bane of our existence last year! You’d think with all the trampling, weeds wouldn’t grow so much in pathways – the opposite, however, is true. So, we have sought out a solution – and so far, we are pleased with the results. 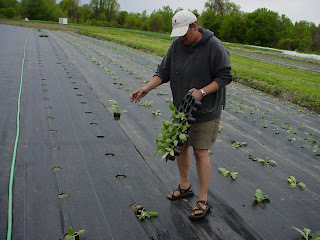 Pictured here is our swiss chard crop. Our field we’re working on is 234′ long, and we were able to purchase 15′ by 300′ sheets that are marked every 12″, so this seemed to be the perfect size for 2 people (and 2 dogs) to roll out. 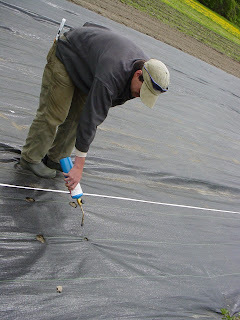 We marked the holes with a propane torch and a 100′ marking tape. Spencer marking holes with the propane torch. It took only 15 minutes to do each bed. 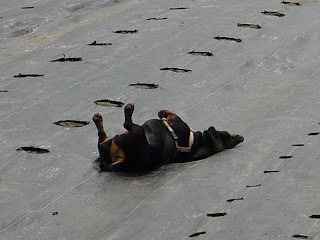 Mr. Smeems loves the landscape fabric – it heats up nicely in the sun, one of the many benefits. And so, the transplanting begins! Spencer catches this nice in-flight artichoke going into the fabric. 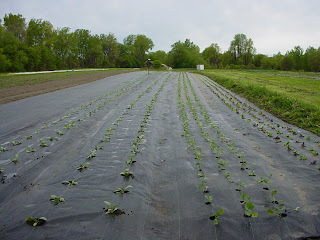 All of the brassicas are in! De Cicco sprouting broccoli, cavolo nero, and romanesco cauliflower. This quip was quickly followed by the realization that not only would we be not getting dirty in our loafing moments, but we would also not be weeding these paths! Success at last! More to come on this subject as the season progresses – we’ll see if it’s all we’ve cracked it up to be! So, we transplanted everything in this section out and then hand watered with a hose and wand – to be replaced this week by drip irrigation. 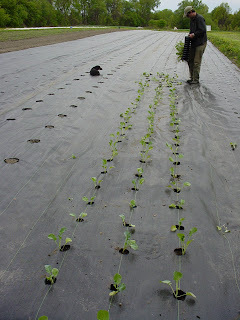 We were happy to see that the plants didn’t get as hot on a sunny day as they normally do on black plastic or biomulch; probably due to the permeability of the woven plastic nature of the landscape fabric. More as we learn! Up next: a pictorial essay of how to use pheasantback mushrooms (aka Dryad’s Saddle) – very in-season and readily available to all trail walkers this time of year. Stay tuned! What company did you order from to get that big of a roll landscape fabric? We order that from Griffin Greenhouse Supply. It is pricey, but it lasts 10 years! We consider it one of our employees, it does such a good job keeping those weeds down! How do you keep the fabric in place?